The island of Curaçao is surrounded by a fringing reef. 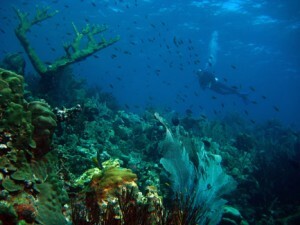 Since near shore development is largely absent and pollution occurs locally only near the inhabited part of the island, Curaçaoan reefs are often in much better condition relative to many other Caribbean sites. Especially the island’s undeveloped, north shore and eastern and western sides of the south shore still harbor coral communities reminding one of reef communities that existed 30-40years ago. Dense Acropora populations are still present and at the island’s eastern side, and Diadema are increasing again in abundance. Reefs are generally characterized by a 50-100m wide sandy reef flat in which scattered patch type coral communities are present. 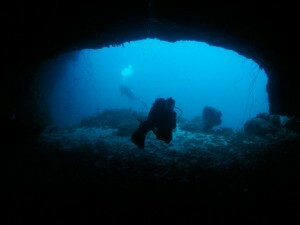 Around 8m depth, the reef flat starts to slope down to depths between 60-90m. Coral cover can be extremely high (>70%) and an approximately 65 coral species can easily be found at any site around the island. 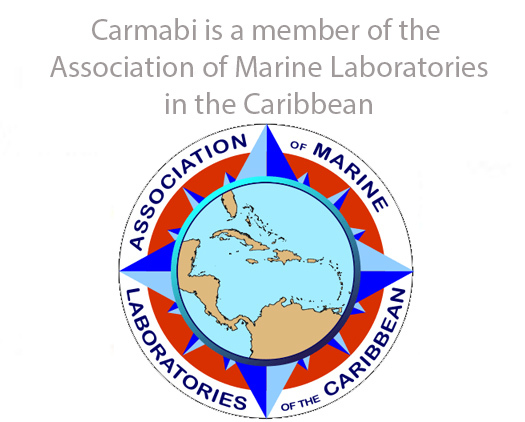 Nearly all reefs/ community types can be accessed from shore, including those in front of CARMABI. The ease by which reefs can be accessed makes them extremely suitable for more elaborate or intensive experimental approaches. In addition to its fringing reefs with a total surface of 20 km2, large inland bays can be found around the island in which mangrove/seagrass communities occur that serve as nursery areas for certain types of reef fish. 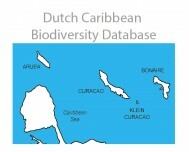 The number of known fish species for Curaçao is currently 358. Although the reef profile is variable along the coast, a general pattern can be distinguished. From the shore, mostly consisting of steep cliffs and rubble beaches, a submarine terrace gradually slopes to a “drop-off” at 7-12 m depth (Bak, 1975). Here, the reef slopes steeply downward at 45°-90°, sometimes interrupted by an inclined terrace at 50-60 m, to a second drop-off at 80-90 m. Below 4-5 m, coral cover and diversity increase towards the first drop-off, shifting from a sandy bottom towards a substrate of coral rock and living coral dominated by Montastraea annularis, Agaricia agaricites, and Madracis mirabilis (Bak, 1975). Coral cover and diversity remain high over the drop-off, but they decrease rapidly below 35-40 m where the influence of sedimentation is high. Here, calcareous red algae become abundant, although some coral species are found down to a depth of 80 m (Bak, 1975). 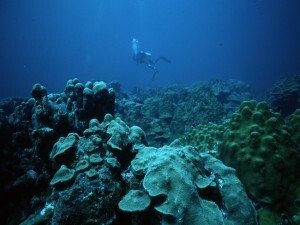 Coral cover can be extremely high (>70%) and approximately 65 coral species can be found at any site around the island. Bak and Nieuwland (1995) found that during the last two decades coral cover and number of coral colonies has decreased on the shallow forereef (depths 10 and 20 m), but not so much in deeper water (depths 30 and 40 m) in Curaçao. Nearly all reefs/ community types can be accessed from shore, including those in front of CARMABI. In addition to its fringing reefs, large inland bays can be found around the island in which mangrove/seagrass communities occur that serve as nursery areas for certain types of reef fish. It is currently assumed that this large number of fish species is related to the presence of the numerous marine habitat types that are present on the island. 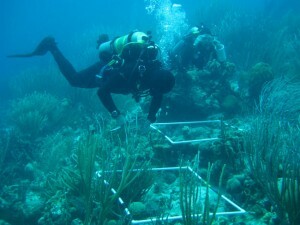 The reefs of Curaçao are overfished as a result of high fishing pressure and the uncontrolled use of spear guns, fish traps, and gill-nets (Van’t Hof et al., 1995). In 1984, Leloup and Van der Mark found groupers (Serranidae) to be smaller and less abundant on the reefs of Curaçao compared to those in Bonaire, and suggested the higher degree of spearfishing (presently prohibited) in Curaçao as a likely cause. Coastal development activities, such as sewage discharge and artificial beach construction, are likely to have caused the decline of the shallow reefs (Bak and Nieuwland, 1995). Massive coral bleaching has been documented for Curaçao reefs: in 1987, 1990, 1995 and 1998 whereby the coral Montastraea annularis and plating Agaricid corals were most heavily affected. Several diseases have had detrimental effects on coral reef organisms of Curaçaoan reefs in the 1980s and 1990s. In 1980, the corals Acropora palmata and A. cervicornis were affected by white-band disease (Bak and Criens, 1981), and in 1983 the population of the sea urchin Diadema antillarum was reduced by 98-100% by an unknown cause (Bak et al., 1984). The latter resulted in a significant increase in cover of fleshy and filamentous algae in combination with a general decrease in coral, crustose coralline, and/or loose sediment cover (De Ruyter van Steveninck and Bak, 1986). In 1995, the sea fan Gorgonia ventalina was affected during widespread mortality in Caribbean sea fans (Gorgonia spp.) (Nagelkerken et al., 1997). Black-band disease in corals is rare in Curaçao (Bak and Nieuwland 1995). In 1999 and unusual west-east moving hurricane caused severe damage to all westfacing coral communities on the island (Bries et al., 2004) though these same areas now show remarkably high numbers of coral recruitment to the now sediment-free substratum. Bak, R. P. M. 1975. 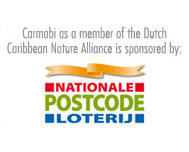 Ecological aspects of the distribution of reef corals in the Netherlands Antilles. Bijdragen tot de Dierkunde, 45(2):181-190. Bak, R. P. M. 1977. Coral reefs and their zonation in the Netherlands Antilles. AAPG Studies in Geology, 4:3-16. Bak, R. P. M., S. R. Criens. 1981. Survival after fragmentation of colonies of Madracis mirabilis, Acropora palmata and A. cervicornis (Scleractinia) and the subsequent impact of a coral disease. Proceedings of the 4th International Coral Reef Symposium, 2:221-227. Bak, R. P. M., M. J. E. Carpay, E. D. de Ruyter van Steveninck. 1984. Densities of the sea urchin Diadema antillarum before and after mass mortalities on the coral reefs of Curaçao. Marine Ecology Progress Series, 17:105-108. Bak, R. P. M., G. Nieuwland. 1995. Twenty years of change in coral communities over deep reef slopes along leeward coasts in the Netherlands Antilles. Bulletin of Marine Science, 56(2):609-619. Bries, J.M., A.O. Debrot and D.L. Meyer, 2004. Damage to the leeward reefs of Curaçao and Bonaire, Netherlands Antilles from a rare storm event: Hurricane Lenny, November 1999. Coral Reefs, 23: 297-307. De Ruyter van Steveninck, E. D., R. P. M. Bak. 1986. Changes in abundance of coral-reef bottom components related to mass mortality of the sea urchin Diadema antillarum. Marine Ecology Progress Series, 34:87-94. LeLoup, M. J., C. Van der Mark. 1984. De dichtheden en grootte samenstelling van de roofvis populaties op de koraalriffen van Curaçao en Bonaire, bepaald volgens verschillende censusmethodes. 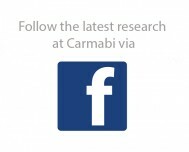 Unpublished report, Carmabi Foundation-University of Amsterdam, The Netherlands, 68 pp. Nagelkerken, I., K. Buchan, G. W. Smith, and 11 others. 1997. Widespread disease in Caribbean sea fans, II: Patterns of infection and tissue loss. Marine Ecology Progress Series, 160:255-263. Van’t Hof, T., A. O. Debrot, I. A. Nagelkerken. 1995. Curaçao Marine Management Zone: A Plan for Sustainable Use of Curaçao’s Reef Resources. Unpublished report, Curaçao Tourism Development Bureau/Carmabi/STINAPA, 89 pp.